Lindsey Conley focuses her practice in business and consumer financial services litigation. Ms. Conley represents debt buyers and debt collectors in actions involving claims under the FDCPA, FCRA and TCPA. She also has assisted in defending complex class action and multidistrict litigation matters. Ms. Conley assists with all phases of litigation regarding the defense of federal and state law claims. Ms. Conley joined Hinshaw & Culbertson LLP as an associate in October 2014. Previously she was for one year a law clerk with the firm, and a summer associate in 2013. 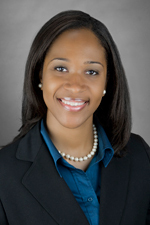 During law school Ms. Conley served as a judicial intern to the Honorable Jacqueline P. Cox, U.S. Bankruptcy Court, Northern District of Illinois, Eastern Division. She also interned in the General Counsel's office of an international food manufacturer in Illinois. In addition to her other law school accomplishments, Ms. Conley was a member of the Dean's List and a CALI Award recipient for Legal Writing. She served as Treasurer of the Black Law Students Association, and worked as a teacher's assistant for Legal Analysis, Research & Communications. Ms. Conley represented a road and construction company in defending violation of non-compete agreement claims.